The Vernier Thermal Analysis Plus app makes it possible to analyze temperatures of up to four spots or regions and collect temperature data as a function of time. Examine the in-app graph, select different points or regions to examine, collect time-lapse videos for longer experiments, or export data to Graphical Analysis GW or Logger Pro for further analysis. Thermal Analysis Plus requires a FLIR ONE™ Thermal Camera. 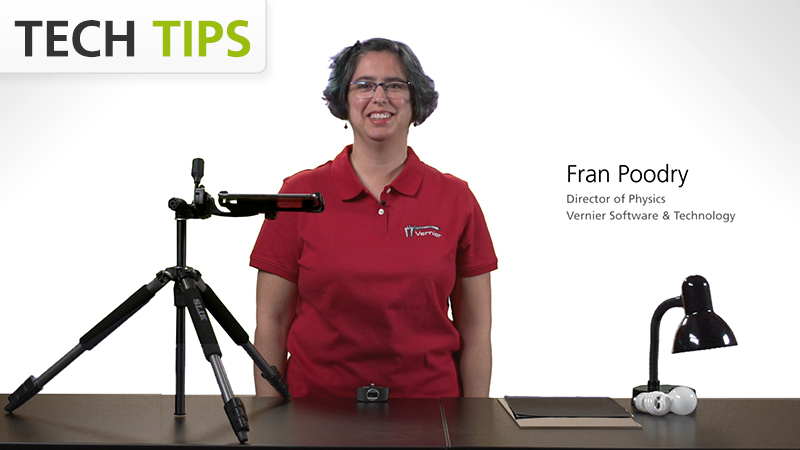 Follow along as our Director of Physics, Fran Poodry, walks through the functions of our free Thermal Analysis app using the second generation FLIR ONE camera (discontinued). You’ll learn how to analyze the absorption of radiant energy, evaluate the transmission and reflection of infrared light, and determine respiration rate. These functions are also available on our paid app, Thermal Analysis Plus, which is compatible with the 3rd generation FLIR ONE and FLIR ONE Pro cameras. Determine respiration rate by examining the temperature of the air exiting the nostrils. Explore the effect of vascularity on skin temperature recovery after brief exposure to ice. Compare reptile skin temperatures under a heating lamp and in the shade. Compare plant leaves from different types of plants, such as succulents, herbaceous, and woody plants, in sunlight and different colors of light. Create a visual representation of thermal equilibration using a combination of petri dishes filled with warm and cool water. Investigate evaporative cooling by observing the surface of various liquids. Observe and measure capillary action with various liquids and types of paper. Analyze heats of solutions using various solids dissolved in water. Observe freezing point depression using one beaker filled with ice and one filled with ice covered in salt. Investigate the transmission and reflection characteristics of infrared light as compared to visible and ultraviolet light by observing a person through various materials. Study thermal conductivity in solids using various materials of similar thickness, such as wood, cardboard, ceramic, steel, and glass. Observe exterior temperatures of a water container while using a temperature sensor to track the interior temperature when performing our “A Good Sock” or “An Insulated Cola Bottle” lab experiments. Analyze the absorption of radiant energy using a desk lamp and sheets of white and black paper. Use the time-lapse video feature to record data for long collection times without filling up the storage on your iPhone® or iPad®. Vernier Thermal Analysis Plus for FLIR ONE™ app requires iOS 11.2.5 or newer. Thermal Analysis Plus analyzes images and videos captured with the FLIR ONE™ Thermal Cameras for iOS.